did u try evolving anyways? just because it says u don\'t have it doesn\'t mean it won\'t evolve..it\'s a glitch from what i understand..because it said i didn\'t have Valkyrie but i got her anyways. go into character/train and try, it wont evo from recruit. also the other reason it may not evo is if the training level is too low. 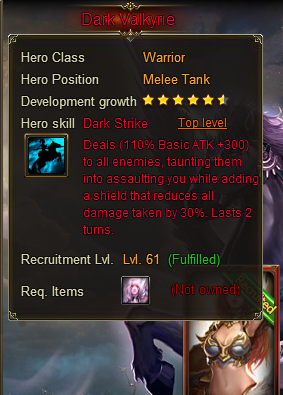 Noticed this on arcane to thunder lord. had to be zues level. 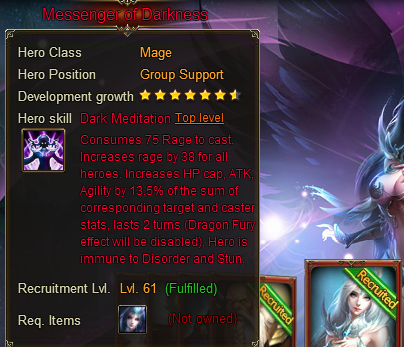 Some heros (like LE to MoD) need to be Zeus Opus before you can evolve the hero to it\'s second form. If you hit the evolve button, it should tell you why you can\'t (your hero has not yet reached..., etc etc). you dont need herosouls for evolves, just the initial recruit of base hero, the icon not fulfilled is a visual glitch. 2019-4-22 08:59 GMT+8 , Processed in 0.059707 second(s), 50 queries .